Whenever you get into coaching up pass protection there are a lot of moving parts to consider. Add the play action pass that you want to throw off of one of your favorite runs and this can make things even more complex. One of the first things to consider is the offensive formation. There are protections that are very sound out of a 2×2 formation distribution that just do not draw up very well out of a 3×1 formation and vice versa. Something as small as where your quarterback takes the snap can also be an issue on a play action pass as the quarterback who takes the snap from under center is often asked to turn his back to the defense on the play fake where the quarterback in the gun does not. This not only affects a young quarterback’s ability to read the defense but it also affects his ability to see problems that can emerge in the form of defensive pressure that attacks a vulnerable area with protection. 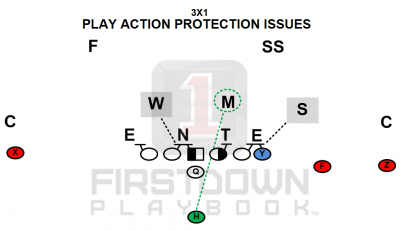 Over the past week FirstDown PlayBook has been installing 3×1 play action passes and even we found ourselves having to install a couple different versions of the same 3×1 play action passes to make sure we have a sound protection scheme for each one. This short video explains with more detail.